Audi's ART robot allows factory experts to remotely inspect vehicles for problems that are difficult for dealership service technicians to diagnose. The service staffers at Santa Monica Audi are getting a high-tech hand to diagnose vexing vehicle issues. 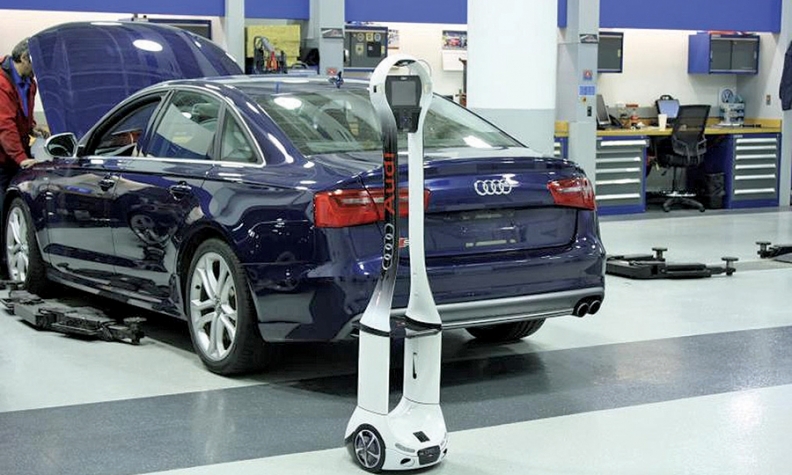 The help is coming from the Audi Robotic Telepresence, or ART for short. Standing around 4 feet tall on two wheels, ART is a robot. It connects service staff and Audi technical experts at the brand's corporate offices to diagnose cars that come in for service with unusual problems. ART's cameras, microphone, speakers and a flat-screen monitor allow Audi's technical experts from the factory to inspect vehicles in service bays and talk things over with dealership service technicians. Audi deployed ART at around 20 Audi dealerships nationwide in a pilot program that began last summer. Now there are around 60 in the field, says Tammy Waitas, Santa Monica Audi's service manager. Waitas says the two-wheeled robot has dramatically reduced the time that vehicles with difficult-to-diagnose issues sit idle in the shop. Before ART, she or her staff would have to call Audi technical experts for help with a difficult diagnosis. Then they would wait for a call back, describe the problem and try the factory expert's recommendation. That back and forth ate up a lot of time, Waitas says. With ART, she says the factory experts can view the vehicles firsthand, meaning diagnosis can happen on the spot and nothing is lost in translation when describing a problem. Waitas estimates that a car that would take two days in the shop can now get done in a single day when ART is used for communication. A coming update to ART's software will make him -- ART's a boy, Waitas says -- even more useful by allowing Audi's technical experts to directly send vehicle software updates through ART, which can upload them to a car through a data connection. "It saves a lot of time," she said. "This way we just get them on the line and they see we what we see." For example, an S5 coupe recently came into the shop for an unusual squeal coming from the brakes, Waitas said. The technicians were unsure of the root the problem, so they connected an Audi technical expert via ART. The in-shop technician sent to the factory expert close-up live video shots of the brake pads and rotors via ART's remote camera. The expert viewed the brakes on his computer monitor, and saw that the pads needed to be replaced, Waitas said. "Sometimes you lose things in translation on the phone," Waitas said. "We can just eliminate that because we're looking at the same thing."